Butler County bass fishing in an often overlooked pond on public property. When it come to Butler County bass fishing, Harbar Acres Lake holds promise. The crowds are gone at this time of year. The crowds of fishermen, that is. But the crowds of bass remain. Harbar Acres Lake in Butler County is not a large lake at just 15 acres. Located on state game land 95, it’s perhaps best known as a trout stocked water, as the Pennsylvania Fish and Boat Commission fills it with brookies twice in spring and once in fall. In between those times, it’s often overlooked. 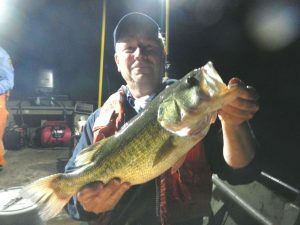 Biologist Freeman Johns with a big largemouth bass from Harbar Acres Lake. “That thing is loaded with bass. 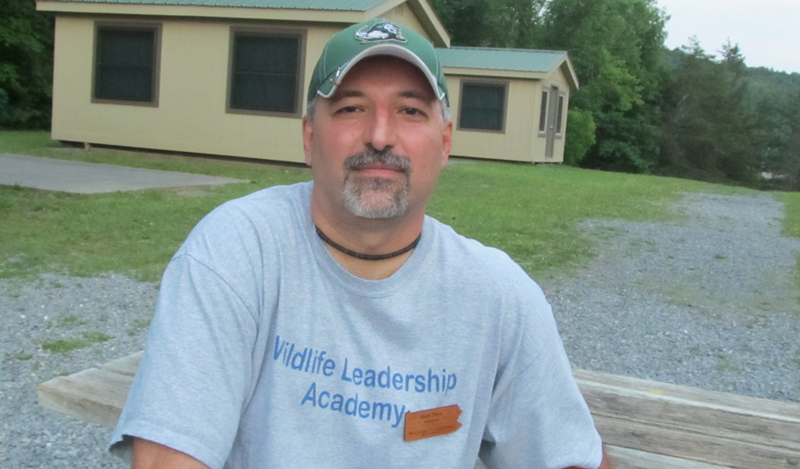 I mean, loaded,” said Tim Wilson, a fisheries biologist working out of the commission’s area 1 office in Linesville. That was confirmed again this spring. Biologists eletroshocked the lake looking for largemouths. They didn’t necessarily have high hopes. “If it was a lake that you didn’t stock with trout, you would expect to see bass like that. But normally when you stock something like that with trout, and get increased angling pressure, the bass get caught as a byproduct and quality decreases,” Wilson said. Harbar Acres is apparently an exception. Its bass are not, on average, very big. Most are sublegal, in fact. Surveying revealed several strong year classes of largemouths, in the 6-, 8- and 11-inch range. But there are some bigger ones swimming in there, too. Crews collected some in the 12-inch range. “Then we had a couple that were over 20 inches, and one or two that were around 18. They were big, healthy bass,” Wilson said. There’s good access to the lake. It’s possible to fish from the bank around at least half of it. There’s a car topper-type launch for unpowered boats, too. And the lake has some other fish, including bluegills, bullhead catfish and some carp. But its real calling card is the bass. So long as you’re interested in just catching lots of fish, with the opportunity to land a nice one occasionally mixed in. “It’s loaded numbers-wise. It was quite a surprise, the number of bass that were in there. It was nice to see,” Wilson said. Harbar Acres Lake is not the only lake on state game land 95. There’s Glades Lake, too. Meaning, it’s not exactly full of fish. Fish and Boat Commission biologists surveyed it this spring as well. The results were very similar to those from when it was last examined in 1997. It appears to support a pretty good channel catfish population, said biologist Tim Wilson. And the panfish – bluegills and crappies, mostly whites – are decent. “But the bass were really, really poor,” Wilson said. That’s probably a reflection of the lake management strategy, he said. 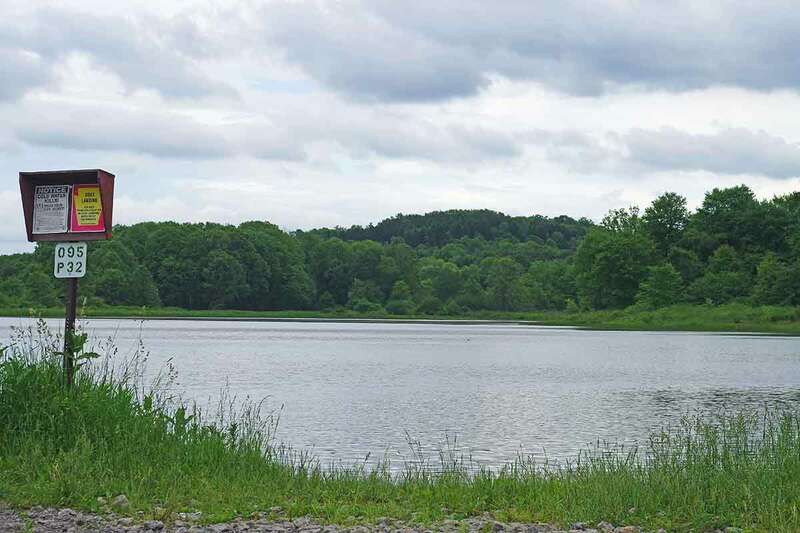 The Pennsylvania Game Commission, which owns the property and lake, raises and lowers the water level throughout the year to support waterfowl. Wilson doesn’t want to change that. But he is interested in seeing if there’s a way to maintain the lake’s value to ducks and geese while also improving the fishing. “We’re going to look at maybe talking to the Game Commission, stocking some fish, seeing if we can improve the bass population some. All within the limits of waterfowl production,” Wilson said. No decisions have been made, he said. In fact, no discussions will even take place before fall. And even then, it’s unclear just how good the fishing can get. The lake has a launch for unpowered and electric motor boats. Shore access is OK. But a large portion of it is closed as a propagation area throughout summer, Wilson noted. “When you can’t get to a big chunk of the lake because it’s closed, you have that refuge-type deal,” he said.